Cellular telephone systems are extremely popular and lucrative worldwide: these are the systems that ignited the wireless revolution. Cellular systems are initially designed for mobile terminals inside vehicles with antennas mounted on the vehicle roof. Today these systems have evolved to support light weight handled mobile terminals operating inside and outside buildings at both pedestrian and vehicle speeds. The basic premise behind cellular system design is frequency reuse, which exploits the fact that signal power falls off with distance to reuse the same frequency spectrum at spatially-separated locations.Specially,the coverage are of a cellular system is divided into nonoverlapping cells where some set of channels is assigned to each cell. This same channel set is used in another cell some distance away. Operation within a cell is controlled by a centralized base station. All base stations in a given geographical area are connected via a high-speed communication link to a mobile telephone switching office (MTSO).The MTSO acts as a central controller for the network, allocating channels within each cell, coordinating handoffs between cells when a mobile traverses a cell boundary, and routing calls to and from mobile users. 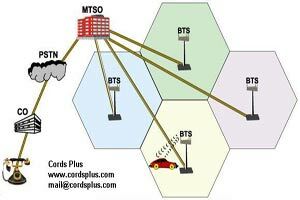 The MTSO can route voice calls through the public switched telephone network (PSTN) or provide Internet access. A new user is located in a given cell request a channel by sending a call request to the cells base station over a separate control channel. The request relayed to the MTSO, which accepts the call request if a channel is available in that cell. If no channels are available then call request is rejected.